Hire the Night Owls to provide spectacular and unique entertainment for your next event! Great for corporate events, festivals, fundraisers, galas, weddings, college events, and birthday parties! The Night Owls provide atmospheric background entertainment for your event, including juggling, and partner acrobatics! This package does NOT include aerial acts, such as silks. Rigging is NOT required. We only have a handful of performers who are able to do these types of events, so bookings are highly subject to performer availability. The Night Owls provide visually stunning background entertainment and ambiance! Great for events with seated dinners, or events with free-flowing pedestrian traffic, indoors or outside. This gets you a minimum of 3 performers and a 45 minute performance on the aerial silks. This is our most popular package! It includes PA support, and mobile DJ / MC services provided by DJ Craig. Depending on performer availability and the suitability of the space, we can also perform on the lyra (aerial hoop), juggling, ground acrobatics, and more! This gets you a minimum of 5 performers and a 60 minute performance with a 10 minute intermission. This package is for full stage productions. Ideal for events where the guests will be seated and fully focused on the performance, such as events in a theater, or with theater-style seating. This gets you a minimum of 8 performers and a 70 minute fully choreographed performance, with music and costuming to match your theme. Includes a 15 minute intermission. We travel! Additional travel costs apply for events more than an hour drive from Johnson City, TN. * Depending on performer availability. Safety is our absolute top priority as a performance company! When using the silks, we require the use of an 8-inch crash mat at all times. With lyra and ground acrobatics, we allow our most advanced performers to choose to use smaller mats if they&apos; staying low to the ground. All of our rigging is installed by trained aerial riggers. Aerial rigging is a highly specialized field, and it is NOT the same skill as theater rigging, arena rigging, construction rigging, rock climbing, high angle rescue, or vertical access. And yes, we have liability insurance! Our specialized insurance policy is written specifically for use by aerial arts performance companies, which is specifically excluded from almost all other policies, including most standard policies held by gyms, universities, theaters, or convention halls. If requested, we will list your venue or organization as an &apos;additionally insured&apos; on our policy, and provide you with a certificate of proof. We set the bar high when it comes to safety, and we like to see others do the same. Unfortunately, there are solo performers and troupes out there that don&apos;t have the same standards. You should absolutely NEVER hire an aerial performance company that can&apos;t show you proof of specialized liability insurance that specifically covers aerial arts, as well as professionally trained aerial riggers, and professionally trained performers from a safe aerial studio or circus school. These are important questions to ask when hiring aerialists! Professional training and specialized liability insurance are not cheap, so in many cases, very low prices can be an important red flag. Safe rigging: More an this below! Crash mats: Generally we provide these ourselves, but if you choose to provide mats, they must be at least 6 ft x 6 ft x 8 in. Security: If alcohol is being served at your event, and you have more than 100 guests, then you must provide at least one designated security staff or volunteer to ensure that guests don&apos;t interfere with our performance. Greenroom: We require a small, private room with HVAC somewhere in the close vicinity of our performance where our performers can change, warm up, and do make-up. Temperature: In order for our performers to safely do what they do, we require a temperature range of 60-82°F, as well as shelter from rain, or winds over 10 mph. These requirements are strictly enforced! We understand that in some cases, this may come down to chance, but in these cases, we unfortunately cannot provide a refund if weather presents unsafe conditions for our performers. There are two main options for rigging. Our preference, when possible, is to rig directly to the building&apos;s structural beams. For outdoor events, or indoor spaces where the beams are not suitable, we can rig using a &apos;portable rig&apos;, which is a free-standing tripod-shaped structure that lets us set up almost anywhere. Large steel I-beams are ideal for us. Often you&apos;ll find these beams above drop-ceilings if you pop out a tile. Open Web Steel Joist (OWSJ) is usually acceptable. These are the "zig-zag" beams you see in any Wal-Mart or big-box store. Very large structural wooden beams can sometimes be used, but will require a report from a structural engineer. Heavy duty box trussing can be used in some cases. We will require a manufacturer load table from the trussing manufacturer, and, in some cases, an inspection by an ETCP certified arena rigger. 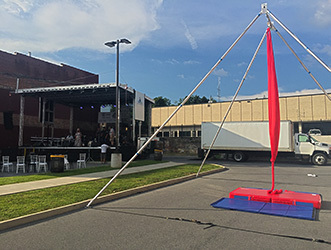 Modern steel cable theatrical fly systems can, in some cases, provide suitable rig points. In some cases we may require an inspection by an ETCP certified theater rigger, and/or a structural engineer. Rigging from trees, 2x4 or 2x6 beams used in residential construction, or concrete ceilings is usually either extremely expensive, or impossible. All of these options will require an engineers report first (or an arborist in the case of trees), and significant additional expenses and time for rigging. In most cases, a portable rig is a better option. We cannot rig from winches, chain hoists, bucket trucks, or articulating boom lifts. Rigging is a complex topic! We always do a site visit early on in the booking process to evaluate the space. As a general rule of thumb, we&apos;re looking for a beam with a working load limit of at least 1000 lbs at the point where we rig, with at least a 10:1 safety factor, giving us a breaking strength of at least 10,000 lbs. If we&apos;re in doubt about the beams, we&apos;ll want to call in a structural engineer, which is an expense that we would pass along to you, if you choose to go this route. We strongly prefer to do all of the rigging ourselves, but in some larger venues, this can be against union rules. In these cases, we will allow certified riggers to configure our equipment, but we do absolutely require the opportunity to inspect all rigging up-close and approve it before we use it. 20+ ft of height preferred, 12+ ft required. Safe and easy access to the beams. In some cases, this may require an additional cost for scissor lift rental. A minimum of 8 feet radius around our rig point(s), unimpeded by equipment, beams, ductwork, stages, tables, chairs, or guests. Portable rigs are a great option for outdoor events, or when indoor beams are not suitable! It fully eliminates potential addition costs such as scissor lift rental, or inspection by structural engineers, arborists, or ETCP riggers, etc. It only takes us about an hour to put it up, and an hour to take it down. However, portable rigs require a very large footprint. They&apos;re excellent for outdoor use. They can also be used in very large indoor venues, where space is not an issue. 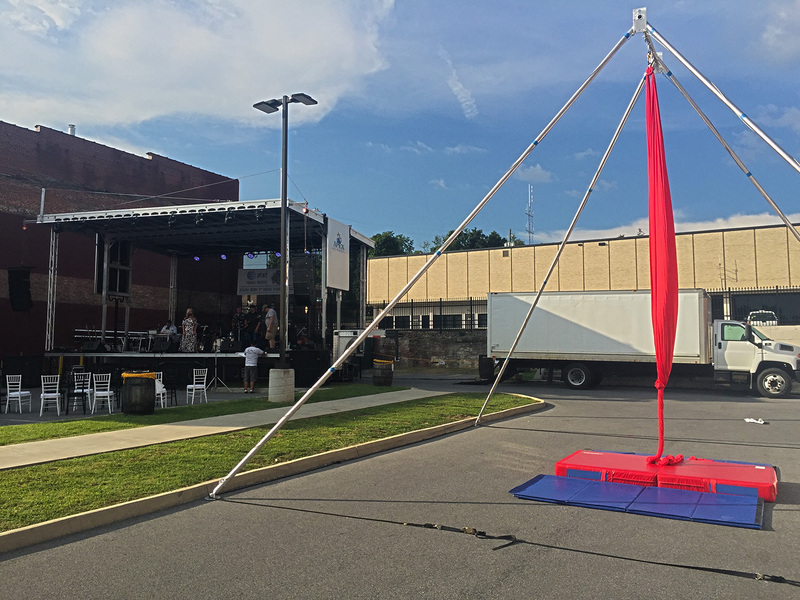 28 ft x 28 ft x 28 ft of open, flat space is recommended for us to set up the outdoor rig at full height for aerial silks. 20 ft x 20 ft x 20 ft of space is the minimum required space, but smaller spaces heavily limit what we&apos;re able to perform. If you have not yet booked a venue for your indoor event, we recommend choosing one from this list! The venues on this list have all been confirmed to have adequate beams for us to rig indoors. Venue owners and banquet managers: If you run an aerialist-friendly venue with large, riggable beams, give us a call! We&apos;d love to set up a site visit at your venue to confirm its suitability, and then add your venue to this list free of charge!